Long-lasting engineered stone material keeps this stone veneer around for a while. Durability is key with this manufactured stone. The flat design of this product makes it versatile. Installation is simple with the panel style. 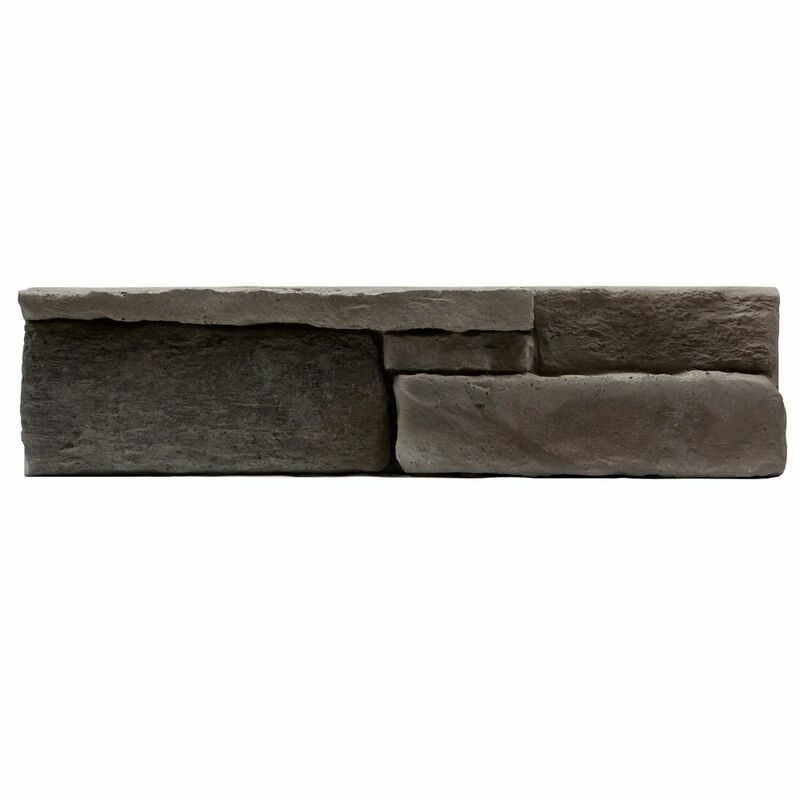 Great Lakes Stone Veneer - Fawn (Small Pack 5-Square Feet) The Fusion Stone "Great Lakes" collection is designed with the natural elegance, rugged strength, and maintenance free virtues of traditional stone. Fusion Stone is a thin stone veneer that offers the affordability and ease of installation to beautifully upgrade your home inside and out. With the easy clip and screw system, installation is quick and mess-free requiring no mortar. Available in four (4) colours, choose from the distinctive rusty and brown multi-hues of Brindle; the relaxed, subdued tones of beautiful Raven; the contemporary, rich and cloudy overtones of Carbon, or the more subtle resonance of dusky Fawn. Great Lakes Stone Veneer - Fawn (Small Pack 5-Square Feet) is rated 2.3 out of 5 by 3. Rated 5 out of 5 by Whistler from Highly recommended I wrote this review after reading a few negative ones and I felt I had to share my experience. I did a large wall 9 ft by 12 ft and was extremely happy with the result. I found the product easy to work with and easy to install. I had to apply plywood to the drywall as recommended and that was the hardest part. Once the starter strip is in place its a snap and actually kind of fun. I did have to cut a piece on each row to size which I did with a basic wet saw for cutting tiles. The pieces are not that thick and cut easily. I did not use a heavy duty masonry saw. The whole job probably took 10 hours and because of the TV it was a bit more complicated but I just rocked in 12 inches behind the TV and put the mount into the studs. (saving product and not having to but my mount into the stone) After my experience I am looking at doing another wall in the house. I will note that I posses a below average "handy man" skill level. I strongly recommend the product. Rated 1 out of 5 by Eric from Not an easy DIY product as it advertised I bought a few cases of these to build a small fireplace (costs $500> on these stones) and below are my direct experience with the product: 1. The cases you buy from HD do not include many NECESSARY parts, for instance, the starter strip for the 1st bottom row, or hearthstone to build a surface. You have to special order them and it takes long time and is very expensive. 2. The sizes of stones provided in the cases are limited and not flexible enough for any projects. You must have a masonry saw to cut them to the lengths needed. I designed my project according to their sizes of stones but still ran short of certain types and had to buy an additional case. 3. As other reviewers mentioned, the length and height of the stones vary greatly. You could have a perfect row with all clips aligned well but then the next line would not fit (especially with corner stones). I had to cut stones multiple times to make them fit. 4. They have a "patented" clip to hold the stones but these clips are not strong enough and are easy to bend. Overall, if you are looking for an easy DIY alternative method as opposed to the traditional concrete stone work, this would not serve you well. You almost need all masonry tools and skills - with that why not do a mortar project. The company had many beautiful demo picture of projects using their products, I wish I had chance to ask them what tools and additional materials were needed to complete those projects. All in all, I managed to get my project done but I hated it during the process and I would NEVER recommend it to other people. Rated 1 out of 5 by Majordevil from Bad product Stone are not even the same height which makes a straight line installation a challenge with the screw in clips. They adertise as being 5” but some are 4 7/8 and some are 5 1/16.